1. The best energy output calculations rely on an accurate wind resource assessment. Unfortunately, publicly available data is typically used to make a “best guess” about the wind resource. This leads to significant error and variability in energy calculations. 2. There is a lack of industry standards. In 2010, the Small Wind Certification Council (SWCC) began testing turbines to newly established standards. This is a valuable step. Manufacturers volunteer to have their turbines tested, but because it is voluntary not all turbines are tested. It will also take time for enough tests to be done to make good comparisons between turbines. Today, manufacturers are able to define many terms and set their own standards. This makes it hard for homeowners to compare information from turbine to turbine. Time – The more a turbine operates the more energy it will make. Accurate energy production estimates can be difficult to derive, but here are some suggestions that will help estimate system size and energy production without relying on manufacturer-defined terms. This will give you a rough estimate of the turbine size for your application. The simple calculation is problematic for two important reasons. First, this is a very rough estimate of system size and, while it does provide a general indication, it is by no means accurate. You will need to work with a qualified installer to better estimate the system size. The bigger issue with this calculation, however, is that it provides the result in rated power (defined below). Rated power is not defined consistently in the industry. This inconsistency makes it a poor measure of comparison. While this quick math might help you to get a general “range” of system size, recognize that it is limited in accuracy. Consumers will be able to size and compare turbines more easily as additional turbines are added to SWCC testing data. In the meantime, however, there are few published sources that provide comparisons of turbines. 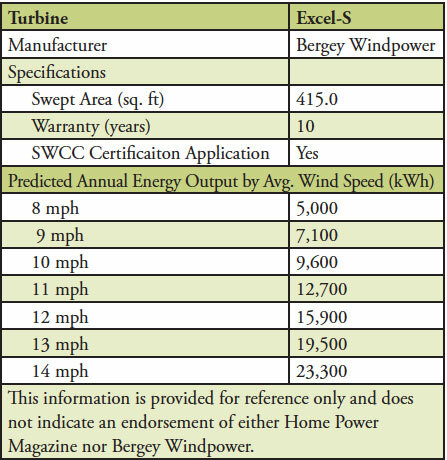 One source is Home Power Magazine, which publishes an annual wind turbine buying guide. Below is a sample of information from that guide, which may help you to understand more about sizing your system. There are additional details provided in this guide, including survey information about each turbine, that you may find useful in comparing machines. According to the table, a consumer with approximately 10,000 kWh per year in electrical consumption and an estimated wind speed (at turbine’s hub height) of 10 mph would be able to off-set the majority of their consumption with this turbine. Take note of the swept area (sometimes reported as rotor diameter). The power equation reminds us that swept area is one of the key determinants of energy output. Therefore, you can use the information in this guide as an indication of likely output at a given swept area. If you are considering a turbine not listed in this guide, you could compare the swept area of the turbine you are considering and the manufacturer’s estimated energy output. You may find some small differences in output between systems with the same swept area, but if the output projections are significantly different, you may wish to ask more questions with regard to how the output calculations were derived. This method is also not perfect because it assumes you have accurately measured your wind resource. Based on the table, a one-mile per hour change in wind speed will change power output by 20 to 40 percent. A qualified installer should be able to help you both accurately assess wind speed and more accurately determine an appropriate system and system size for your situation. There are economies of scale in small wind. In other words, a 10-kilowatt system is not ten times more expensive than a one-kilowatt system. As will be discussed in Step 6: Economic Considerations and Incentives, you may wish to use online calculators to discover the differences in output and economic return with various system sizes. Most installers recommend that you optimize the system size for your consumption and work to offset the majority of your energy needs. You may wish to consider seasonality of your demand or any changes in greater energy efficiency as you size your system. In most states, it does not make financial sense to purchase a system that is larger than your needs. In some states (like Montana), excess generation is donated to the utility. In others (such as Wyoming), excess energy may be purchased, but is usually purchased at “wholesale” or avoided cost rates (not the much higher retail electricity rate), so the revenue is not usually enough to justify the additional investment in a larger system. Total rotor diameter is a good way to compare equipment. Do not necessarily assume that total cost per foot of swept area is the best measure of value for a wind turbine. Cost per foot of swept area will favor lightweight equipment, which may not be as durable as heavier equipment. A better measure of robustness is the tower top weight per swept area. Generally, greater tower top weight indicates a more durable turbine. The tower top weight is usually provided in information from the manufacturer. When sizing your wind system, be aware that a wind turbine will lose some of the power generated. The amount of loss will vary by the system. Total losses of eight to 15 percent should be assumed for issues like availability, yaw, icing, electrical inverters, line losses, and other factors. Energy production will also vary due to changes in wind speed. According to the National Renewable Energy Laboratory (NREL), annual wind speed can vary from the average by plus or minus 10 to 15 percent and annual energy production can vary by as much as 30 percent. Information from manufacturers is rarely presented in the same format. The same manufacturer may use different assumptions for different turbines. The information is also different between manufacturers. This means you have to investigate both what is being said about a turbine and what assumptions are made behind the data. Understanding some common terms may help you review this information. Without industry standards, it is hard for you to know what assumptions were made in the manufacturer’s calculation. The calculation assumes the wind resource was correctly estimated. If your installer is providing annual energy output calculations, be aware that most manufacturers use a range of 8 to 14 mph average wind speed in their calculations. The wind resource in the calculation needs to match the wind speed at your site. Some experts recommend multiplying manufacturer annual energy output calculations by 75 percent to adjust for possible overestimates of actual energy output. Many manufacturers show power curves. Power curves can be used to estimate the annual energy production using the “Method of Bins.” The Method of Bins takes power production at each wind speed and multiplies it by the hours per year the wind blows at that wind speed; this results in an energy “bin” for each different wind speed. The total energy output is calculated by adding the energy production in all bins. Power curves can be hard to use and understand. It helps to know how the power curve was created. Some manufacturers use years of field data to create their power curves. Others lack this data and generate a power curve based on computer models. Always ask for a power curve based on actual measurements. If a manufacturer indicates they do not have a measured power curve, it indicates they do not have a fully tested turbine. The cut-in speed is the wind speed when the generator begins producing power, usually around eight miles per hour. Wind speeds below seven mph provide little, if any, usable power; perhaps enough to keep the rotor spinning, but not much more. All turbines should control their power output in strong winds, by reducing the rotor’s exposure to the wind, (such as furling out of the wind or pitching the blades). The cut-out speed is the wind speed where the turbine shuts down to protect itself from very strong winds (e.g. 50 mph). Many small wind turbines do not have actual cut-out wind speeds. Some will continue to produce power in high wind situations. By examining the power curve graph above, the cut-in speed of the turbine is around nine mph, and between 25 and 30 mph it begins limiting its power output. By 35 mph, it is protecting itself from extremely strong winds and producing only very limited power. Understanding both the wind resource at your site and the cut-in and cut-out speed of a turbine is useful for selecting the best turbine for your location. Rated wind speed is the wind speed at which a generator reaches its rated power. To understand this, refer back to the function of the power equation. Because wind speed is a cubic function, doubling wind speed results in eight times more power. The reverse is also true. If is cut in half, there is one-eighth the amount of power production. Some manufacturers size the wind turbine by the size of the generator. A turbine with a five-kilowatt generator would be called a five-kilowatt wind turbine. This is not an accurate measure of energy output. Paul Gipe, an industry expert on small wind, says, “By this logic, you could slap a six-foot plank on the end of a 25-kilowatt generator and call it a 25-kilowatt wind turbine.” Wind energy production comes from wind speed, swept area, air density, and effective blade technology. Because of variability in wind speed, air density and blade technology, the generator will not operate at its full potential 100 percent of the time and thus, is not an accurate indication of energy output. Peak output is a term used in marketing materials, but is not very helpful in many situations. The manufacturer sets the definition. Peak output can be useful in determining electrical connection (i.e. – sizing circuit breakers). However, because it may or may not refer to the maximum output of the turbine, it is a poor method of determining energy output. This term refers to the maximum amount of wind the turbine can withstand without damage. The information is not very helpful because it is hard to know if the information is correct and what standards were used to establish this figure. Also, in a “maximum” wind, there is likely to be debris (sticks, leaves, plastic bags, etc.) in the air that could damage the turbine long before the force of the wind does damage. Rated output is a power output at a certain wind speed. The problem with rated power is it is defined by the manufacturer. The term comes from the solar photovoltaic industry, where panels are tested for output at a fixed light intensity and fixed temperature. These standards have only recently been defined for wind, they are not yet well established in the market place. Rated output is a poor method for calculating energy output because there is no standard definition. Remember–the most consistent means of comparing wind turbines is the total rotor diameter or swept area. J.F. Manwell, J. M. (2010). Wind Energy Explained. West Sussex: John Wiley and Sons, Ltd.
Sagrillo, M. (2002, August & September). Apples and Oranges 2002: Choosing a Home-Sized Wind Generator. Home Power Magazine, pp. 50-66.